• Collected material from The Village, The Nobility, Dwarves, Elves, and Halflings, and The Elders, including old favorites, like the Nobleman’s Wild Daughter, the Assistant Beast Keeper, and the Dwarven Mentor. • Six new Character Playbooks, including the Knightless Squire, the Recluse Wizard, and the Gnomish Godparent. • New spells, rituals, magic items, rare herbs, traits, and bestiary entries. • Guidelines for making your own Character Playbooks. Is this a 5th edition D&D... or is it Old School? It's old-school. BEYOND THE WALL is a retro-clone. So what is the POD cost then? Want to know how much more would go to the team. The POD cost changes from time to time. The easiest way to determine the price is to select the hardcover book and enter a price of zero. The cart will provide an error message that lets you know the minimum price, which is the cost of printing. Ah gotcha, thanks for the info! If you're having trouble with the ordering process, DriveThru's customer support has been quite helpful when I've had questions and concerns. I recommend reaching out to them. I tried to purchase the POD for this after it released, and Drivethru submitted my order as the zip only. I just noticed after checking up on my order (I ordered Further Afield as well, and only thought to check status after I got FA but not HYO). Now if I want the POD I have to pay what, the minimum cost to print the book? Again? I paid more than that last time, and apparently Drivethru thought it was just for the zip (which I already had from the initial release). Not happy. I realize it isn't Flatland's fault, but still, not happy. I'm afraid I can't correct this myself, but DriveThru's customer support has been quite helpful when I've had questions and concerns. I recommend reaching out to them and providing your order number. Yeah, I plan to. Again I know it isn't you. Just frustrated. I think it was confused because I already had the zip before the POD came out. Wow, and they just put in a POD for me, printing and on the way. 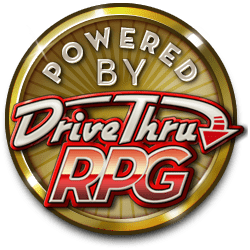 I am extremely impressed, and glad to continue to give Drivethru my business. I would love to purchase a POD of this... but Drivethru wont let me. Thanks for helping clear this up. I was able to place my order! Cannot wait for POD. We started a session last weekend and I have never ever gotten a response like the one i got. I printed a huge village map on poster paper and made everyone draw in the locations and they WENT WILD! Im digging the playbooks, the scenario books and the threats... its basically amazing.